Most people don’t give planning a thought when they think about building a tree house. And yet, as of a change to regulations brought in for England and Wales in late 2008 (an amendment to The Town & Country Planning Order 1995), any permanent structure with a roof line of more than 4m or any raised structure in a garden more than 3m above ground needs planning permission. The tree specialist, who will charge a fee of between £500 and £600, will have to inspect the trees and examine their health and will be interested in what fixings will be used and how the structure will be supported over the roots. ‘You may need to lop off branches or carry out some health maintenance.’ Next, you’ll have to submit a planning application, costing £150, which you can either do yourself or through a surveyor. David and Kate Hicks Beach, who live near Cirencester in Gloucestershire, have just put up a tree house in their garden at a cost of approximately £20,000, plus another £2,000 to obtain planning permission, which Property Pathfinder handled. ‘It’s a lot of money, but I’ve always wanted a tree house, and once we realised we had to get planning permission, we thought “why not put up a big one?”,’ explains Mr Hicks Beach. The couple have three children aged 13, 11 and 8, who adore the tree house, but they aren’t the only ones to benefit. Mr Hicks Beach enjoys the peace and quiet and loves being able to listen to the birds, and his wife, who teaches singing, uses it for book-club meetings. Alerted to the fact that the structure would need planning permission because a neighbour had failed to apply and had been asked to remove their tree house, the Hicks Beaches used a company called Squirrel Design (www.squirreldesign.co.uk), which is based nearby in Malmesbury and makes bespoke tree houses. ‘It came up with a marvellous design and provided all the plans and sketches we needed.’ It then took about five months to get the required planning permission as the conservation officer was worried about the type of wood. The smallest tree house that Derek Saunderson of Amazon Treehouses in Ayrshire (www.amazontreehouses.com) has made was 6½ft by 10ft, which was only 5ft off the ground and cost about £5,000. And the largest? 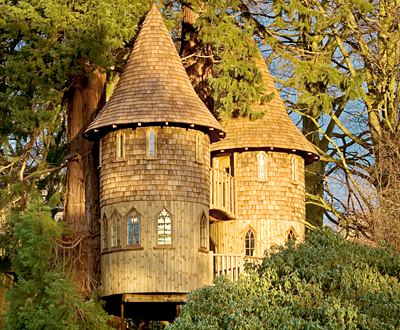 ‘I built an enormous 23ft circular tree house with a turret, which cost £35,000,’ says Mr Saunderson. For inspiration, look no further than New Tree-houses of the World by Pete Nelson: a new edition will be published on May 1.